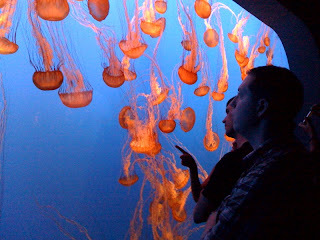 Rand and I drove to Monterey today to visit the aquarium and enjoy our last day of the 4-day weekend. I think the jellyfish were my favorite part (even though the otters were cute). The light and colors were great. Afterward, we got some candy and drove to Carmel and walked barefoot on the beach. Then we had dinner outside at a little Mexican bistro. My carnitas were yummy. Darling Todd, That's all fine and dandy but I hope you remembered the real reason for Labor Day and put your whites away, we can't have you neglecting your fashion duties just so you can imitate Deborah Kerr's beach scene from From Here to Eternity. and right away I'm stung. But you've paralyzed my tounge. and told you I love you. and now I just hold goo.